Welcome to the Reception page. Please take the time to have a look at what we have been doing so far in Reception and also what we will be doing as the year progresses. Our Teaching Team consists of Mr Cranidge, Mrs Jones, Mrs Leader, Mrs Hall, Mrs Adams, Mrs Jelley, Mrs Brown and Mrs Hersey. We enjoyed talking about Easter and all the fun things we can do in the Easter holidays. We did lots of Easter writing and craft and even had our own Easter egg hunt. We learnt about the Easter story and could put the story in the correct order. In maths we have been learning about 3D shapes. We had a visit from Peaks Lane Fire Station. They arrived in their fire engine and all of the children had a turn to explore the equipment they use and were able to try on a fire helmet. The children enjoyed having turns of squirting the fire hose and going inside the fire engine. The firefighters even turned on the siren and flashing lights. We have really enjoyed learning about People who help us in the real world. To kick start our work on Superheroes we came to school dressed as our favourite character. We enjoyed talking about superheroes, their costumes and their powers. We wrote about our character and made a special logo. We had lots of fun celebrating World Book Day! We enjoyed dressing up and we were confident to talk about our characters and our super costumes. We shared our favourite books with our friends. We used our sounds to write about our characters and write a book review. We also made our very own book marks. This week we had an exciting visit from PC Daz and PC Nick who came to talk to us about danger stranger. They arrived in their police van and all the children had a turn to explore the equipment they use and tried on some real life uniforms. PC Daz and PC Nick also helped us investigate the evidence that we had collected regarding Olaf's disappearance. We were over the moon when Olaf returned and we uncovered that the culprit was Burglar Bill all along! This week we arrived back to class after half term to find a crime scene! Our small world was a mess and everything was on the floor! We used our detective skills to investigate what had happened. We found a muddy footprint and lots of fingerprints. We were shocked when we realised Olaf had been stolen! We have been busy making lost posters and wanted posters to find the naughty person. We talked about how it is not nice to take other people’s things. We hope the Police will help us to get Olaf back. We have been discussing all of the people who help us in our life. We have been telling stories about emergencies in our small world. We have enjoyed being doctors and nurses in our Doctor’s Surgery. In maths we have been learning our doubles. We have helped the Doubling Detective to work out his doubles using our finger prints. On Monday we received a mysterious parcel. It was from Elsa. She had accidently frozen her friends and needed our help to rescue them. 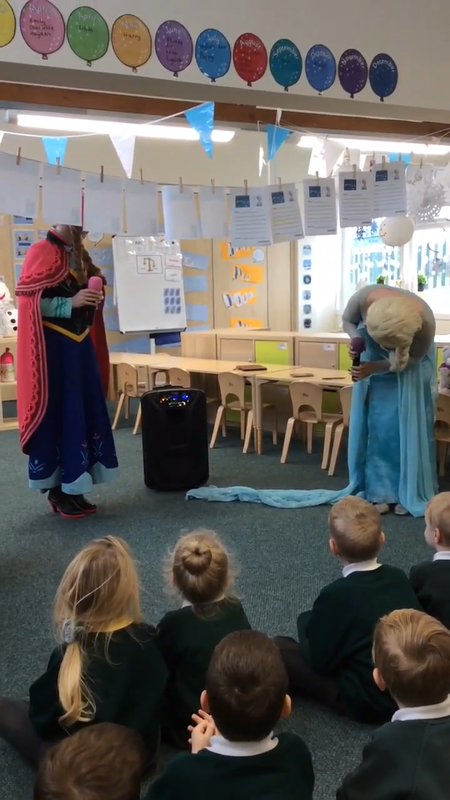 The children thought about how they could melt the ice and save Elsa’s friends. The children were so excited trying to melt the ice in their hands! Elsa said she might visit if we did a good job. The children wrote letters inviting Elsa to our school. We read the story Frozen and talked about the different characters. We did a vote to find out who was our favourite character and we made a class tally table to find out the winner. In literacy we wrote who we liked the best and why. The children have enjoyed colouring pictures, writing about the characters and doing crafty art work. The children built ice castles, built snowmen using snow dough, retold the story in the small world area and cracked secret codes to find hidden words. In maths we have continued learning about measure. We used the scales to compare fruit and vegetables and find out which was the lightest and which was the heaviest. We weighed items from around the classroom, we tried to balance the scales using cubes to find out how much things weighed. Elsa must have received our letters! We were so excited to meet Elsa and Anna. We enjoyed singing songs with them and showing them our classrooms. 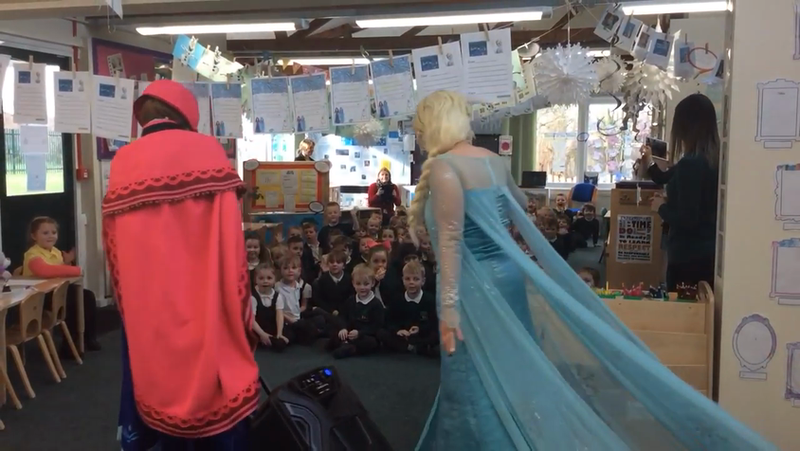 Elsa even showed us her magic and made snow! This week we have been practising our Talk for writing for our story The Polar Bear and The Snow Cloud. We have enjoyed retelling the story in our small world and have written the story in our literacy lessons. We have been creating lots of polar animal art and craft. We have enjoyed reading books and using the internet to find out lots of interesting facts about the animals. We have continued measuring length and height using cubes and rulers to compare the size of different polar animals. We have used QR codes and iPads to find out the measurements of different animals. It was fun using the rulers to find out how big they actually were! This week the children have extended their topic about winter and discussed how the climate is different in certain parts of the world. The children looked at a globe and we talked about different countries ... the children were fascinated at how small Great Britain was. We learnt more about the polar regions and went on a fact finding mission to identify the different animals that lived in this habitat. In maths the children used the animal facts to learn about measure. The children used the language of tall(er) and small(er) and long(er) and short(er) to compare different animals and their footprints. We used cubes, rulers and meter sticks to measure different lengths and heights of the polar animals. The children enjoyed measuring themselves against a life size emperor penguin and finding out how tall they were. The children then explored their environment measuring and comparing heights and lengths to consolidate their learning. The children were amazed about how tall a polar bear was (6m when stood on their back legs) and we learnt more about these gigantic bears. In literacy the children wrote facts about polar bears using some of the new words they have been learning in phonics. We got creative making cotton wool polar bear faces and cutting out and ordering different sized polar bears and penguins. Wow what a busy week! This week we have enjoyed talking about Winter and the changes that happen. We went outside on the the field one frosty morning to explore. We made footprints in the crunchy grass and touched the frost, watching it melt in our warm hands. We found frosty leaves and twigs. We could even see our warm breath in the cold air. We have written about what we can see in Winter this week and we have learnt a new tricky word 'are’. We have been threading beads onto snowflakes to help strengthen our fingers. We have been making snowmen faces and painting Winter pictures in craft. In maths we have been practising carefully counting out buttons and putting them onto the snowmen and adding two groups together. 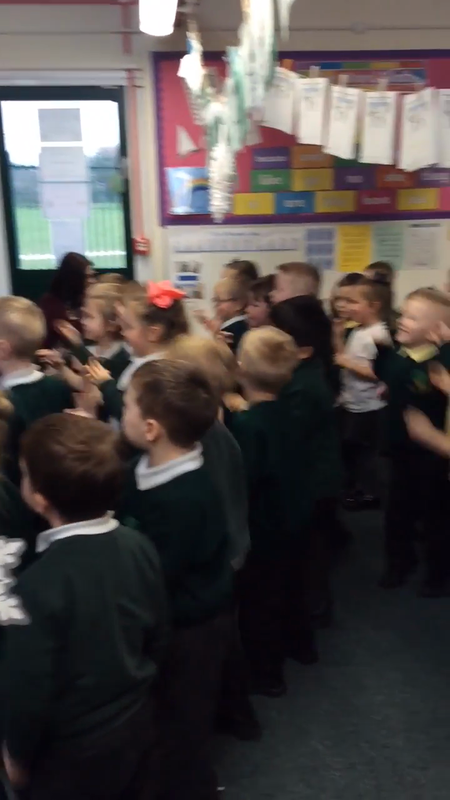 The children were excited to be back at school after their Winter break. There has been lots of conversation about where the children have been and what they have been doing over the school holidays. Not forgetting what their favourite Christmas present was! They then used this talk as a prompt to write a thank you letter to Santa in literacy. This term our topic focus is Winter. We have introduced the story of Jack Frost and the children have enjoyed retelling the story in the small world area as well as using the ice bricks to build a house for Jack Frost. The children have been using fantastic language and imagination in the role play area as they act out senarios in the winter cafe. This week in maths, the children have been consolidating their counting skills and have been counting out snowflakes. The children have been practising their cutting skills by making snowflakes and have worked together to make paperchains. The children have had a very busy first week back! All of the children in Reception have been practising lots of songs and their lines for our special Christmas performance over many weeks. We were so excited to wear our costumes and perform to our grown ups. We were very brave to stand on the big stage and deliver our lines and sing together. We were very proud of our concert and we hope you all enjoyed it! We enjoyed wearing our Christmas jumpers. 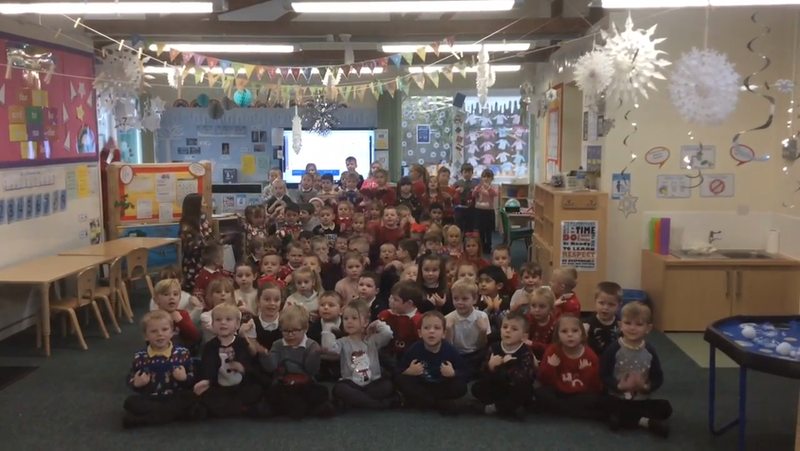 We were confident to stand in front of the class and describe our festive jumpers. We carefully designed a jumper just like the one we were wearing. This week we have been enjoying our Christmas activities. We have been busy practising our Little Nativity and we are looking forward to impressing our grown ups with our performance soon. We have been retelling the nativity story in our small world and writing about our characters. We have had lots of fun in our Santa’s workshop making presents🎅. In maths we have been learning our 2D shapes and making funny snowmen with the different shapes.